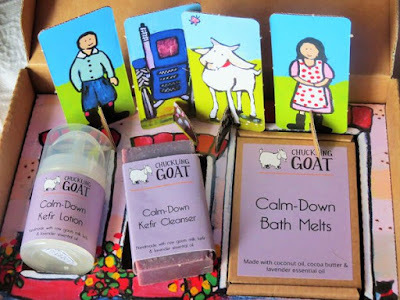 I was recently sent the beautiful and unique Calm-Down Kefir Toolkit (£19.95)* to review. The exquisite packaging is designed by local artist, Helen Elliot and the little cardboard dolls are directors, Rich and Shann. The range is handmade with love in small batches on the family farm in Wales. Kefir is a live culture fermented milk product which originated in the Black Caucasus mountains of Russia. 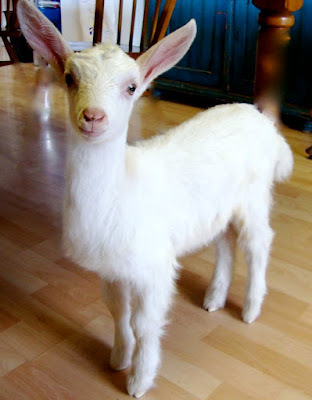 Goats milk Kefir is made by hand on the farm with pasteurised goats milk and live Kefir grains. Probiotic Kefir is a natural choice and is tart and slightly fizzy and quite similar in taste to yoghurt. You can buy direct from the farm see HERE. The Award Winning Kefir is also used to make handmade natural beauty products which are suitable for all skin types and those who suffer from eczema, psoriasis, dermatitis, rosacea or acne. Calm-Down Kefir Cleanser - a lavender scented soap which is made with raw goats milk, Kefir, Coconut Oil and sustainable Palm Oil. The soap lathers gently and is lovely to use and helps to aid a restful night's sleep. Calm-Down Kefir Lotion 50ml - a light lotion which absorbs quickly leaving the skin gently scented with lavender. The lotion is made with anti-inflammatory goats milk, award winning Kefir, Finnish oat oil, olive oil and rice bran oil. The lotion soothes dry skin and calms the mind. Calm-Down Bath Melts x 6 - made with a base of nourishing cocoa butter and coconut oil and scented with lavender. Pop one in your bath for a calming and relaxing dip. I think the products (and the company's name) are absolutely fantastic and I highly recommend them. You can see the full range HERE. Lush! I am so keen to try the break out range from this brand. I've been considering buying the supplies to make my own kefir recently, but worry I won't be able to keep up with making it daily!